It might be Lite in name but the PUV-44XPL-4K22-KIT 4 x 4 HDMI HDBaseT LITE Matrix is packed full of technology. 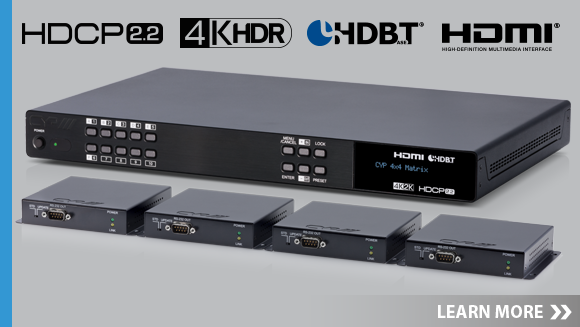 Offering 4 HDMI sources to 4 HDBaseT LITE outputs and 2 independent HDMI outputs, the HDBaseT LITE technology utilised within the system is the most advanced yet, giving integrators one of the simplest-to-install 4K matrix packages available. Supporting high-resolution video signals (up to and including 4K2K@60Hz, HDMI2.0, HDCP2.2, and HDR), the four HDMI inputs are switchable across four HDBaseT LITE outputs and two additional independent HDMI outputs. Utilising the latest HDBaseT LITE technology, the HDBaseT outputs transmit signals up to 60m via a single CAT5e/6/7 cable, whilst the independent HDMI outputs support cable lengths of up to 10m at 1080p (5m 4K@60 YUV4:4:4). Further increasing ease of installation, the KIT is supplied with four PUV-1210PL-RX receivers that support PoH (Power over HDBaseT), meaning each of the receivers gets its power from the main matrix via the same single CAT cable, negating the need for additional power at the display. As well as 4K & 3D video content, the matrix also supports high resolution digital audio formats, including LPCM 7.1CH,Dolby TrueHD, Dolby Digital Plus, Dolby Atmos and DTS-HD Master Audio. When combined with the audio breakout functionality, which provides de-embedded analogue L/R audio outputs for each of the HDBaseT zones, the PUV-44XPL-4K22-KIT confirms that it is a truly multi-faceted matrix. Control of the matrix is accessible from either the front panel selection buttons or via IR, RS-232, Telnet or Web GUI. Matrix and HDMI source control can also be accessed from each display position, as 2-way IR is transmitted along the same single CAT cable back to the matrix. For those looking to add an AV distribution network to a home automation system, we provide control drivers for all the major control platforms. Combined with our industry-leading reliability and support, the PUV-44XPL-4K22-KIT matrix kit is the perfect start point for integrators that require a feature-packed no-nonsense AV distribution system. Simple to install, set up and control, this matrix pack offers incredible flexibility and value for any residential or commercial installation setting.